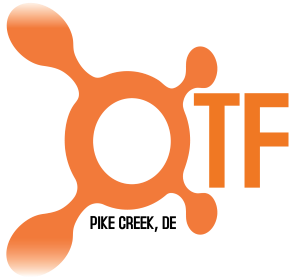 We welcome any club member who would like to be part or our 2018 USATF team! PCVRC competes against other club teams in USATF Mid-Atlantic Grand Prix and Off-Road Race Series each year. You don’t have to be fast to play a role and enjoy participating in events that you may not have entered on you own. Carpool with us, root for each other and celebrate with friends! We strongly encourage all club members to consider joining in one or both of the USTAF race series. 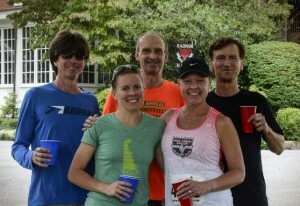 Carpooling to the events creates a nice social atmosphere and often includes post-race dining and refreshments. We don’t need you to commit to the entire race series or be one of the fastest in your respective age group to participate. The races are well organized and offer a variety of lengths and locations. Please consider joining the USATF and coming out with the PCVRC team for new adventures in these races. *Club membership fee reimbursement for completing 4 races in the MA-USTAF race series requires an active USATF membership at the time of the race. The intent of the reimbursement is to encourage members to be eligible to participate in the club team score for the series. USATF membership supports running programs throughout the region and country. Pay annual dues for PCVRC and USATF. Affiliate PCVRC as my USATF club (#0025) each year. Encouraged other runners to join the club, or ask a PCVRC member to participate in one or more USATF races. Participation is key! Fast or slow, 100% ready to race or not, we need to field a complete squad at each event. Racing as a workout, or 75% effort, is infinitely better than 4 runners giving it their all without a 5th to complete the team. Besides bragging rights with the 7 other clubs, there’s the financial incentive: a 2nd on the the Road & 3rd on the Trails will pay $900 prize money this year – this goes towards team-members club dues for following year! We look forward to seeing you on the roads & trails! PCVRC had 30 participants compete in the 2017 Mid Atlantic USATF Grand Prix (road) series. 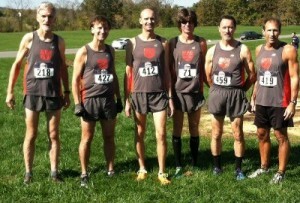 We had runners in all 11 events and fielded a scoring team in 10 of them. There were 13 regional running clubs participating the Grand Prix series. PCVRC finished the 2017 season in 4th place in the highly competitive Grand Prix club challenge. Our 4th place finish earned the club $475!